Is it wrong to be jealous of a TV? There are times when the television holds the attention of my family better than I do, its sound carries farther than my voice and, thanks to the nature of our open floor plan, it is ALWAYS in plain sight. Of course the TV isn't always on, but its proximity to our main living area exacerbates the challenges of our living space. When we first moved into our modest rambler more than a dozen years ago, the open spaces were welcome. We had two small children, and I liked being able to keep an eye on them. Plus, they didn't take up much room. Our living room was filled with toys, and our girls' kitchen sets sat alongside mine. It was cozy, and I loved it. Now the girls are bigger, and there's a boy, dog and piano added to the mix. I am finding that what I once found cozy now feels cramped. And cluttered. I have this piece of Pottery Barn furniture, and it never looks this neat. The living room, dining room, kitchen and entry are all THISCLOSE, which means it doesn't take long for the backpacks to spill into the kitchen or the eating area to spill -- literally -- into the living room. The Little Tikes toys have been replaced by Legos, algebra books, folders, binders, iPods and Kindles. The noise can be deafening, and there are no doors to shut. And then there's the clutter. When you walk into our home, you hit the foyer, which is on top of the kitchen. It becomes an everyday battle to keep the mail, homework, etc., off the kitchen counter. And it's annoying to have to step over shoes and backpacks just to get to the clutter in the kitchen. 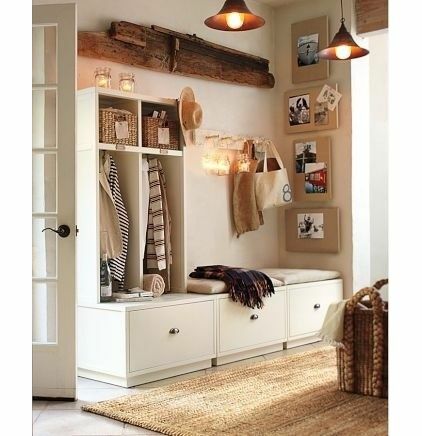 I've tried cubbies, bins, baskets, shelves, cabinets -- you name it. I've been threatening to take the overflowing cubbies out of the entry and shoo the teens into the basement, which is where THEIR living area is. It's only fair that if they have their cluttered living area, I can have my clutter-free one. Right? Ah, but the open floor plan continues to the basement. The teens, dubbed "the sisters" by their little brother, like listening to music (loudly) and playing music. I don't mind either, but often long for a door to the basement to at least muffle the sound, which can turn into noise if there happens to be a dispute over the remote. I do need to be careful what I wish for. It won't be long before the sisters will start to leave home, and I will miss being able to see them sprawled out on the living room floor surrounded by books or playing the piano as I prepare supper. But I do hope they take their clutter with them. What do you do to control clutter in your house? Is it even possible?